Though it is the fifth-largest city by population in the United States, Arizona’s capital of Phoenix rarely gets the attention it deserves, especially on the international scale. Often overlooked for the lush golf resorts and swimming pools of Scottsdale or as a jumping-off point for exploring Sedona and the Grand Canyon, the Phoenix metro area has a lot to offer visitors. Even if you can only spend one day in Phoenix before embarking upon a larger Arizona itinerary, there are innumerable ways you can occupy your short time in the AZ capital. Though you might think of Phoenix solely as a hot, arid, expanse with nothing noteworthy to offer, I assure you this is not the case. Though temperatures in the summer months can soar, there are so many fun and interesting things to do in this desert city that it scarcely matters. With a thriving arts, culture, and restaurant scene along with some of the best day hikes right in the city, you are sure not to be bored during your one day in Phoenix. Have Two or Three Days in Phoenix? Before you begin planning the details of your Phoenix itinerary, let’s discuss what time of year you should visit. The Phoenix Valley is blessed with warm and sunny weather pretty much all year round, however, there are some seasons that are better to visit than others. It probably comes as no surprise that the summer months in Phoenix and Scottsdale can be unbearably hot. Between the months of June – September, daily temperatures average well over 40°C (103°F) and, because of its urban setting, nightly temperatures aren’t much cooler. Needless to say, while the summer is the on-season for most destinations around the world, it is very much the off-season in the greater Phoenix area. Where they can, locals tend to leave town for a cooler setting in the summer and many restaurants close for business during these months as well. The streets will be barren as the few remaining in the city seek refuge from the intense heat in their air-conditioned homes. Summer is also monsoon season in Arizona, where there are torrential thunderstorms and insane dust clouds known as “haboobs.” While the sight of lightning dancing across the desert sky can be quite beautiful, the heavy rains can lead to flash flooding and the high winds can prove to be nervewracking. While the weather isn’t great during the Phoenix summers, one benefit to travelling during this time is that the accommodation prices are often slashed. So, if you’re keen to stay in a high-end resort but have never quite had the funds, consider heading to Phoenix in August! Despite the relative hell that is a Phoenix-area summer, the other three seasons are absolutely beautiful and you really can’t go wrong with visiting in either winter, spring, or autumn. High temperatures in winter rarely dip below 16°C (60°F) and most days are bathed in brilliant sunshine. This is also easily the most popular season to visit as tourist flee their own freezing, snowy homes. Spring and autumn have mild temperatures where you can enjoy 25°C (77°F) sunshine while lounging by the pool or taking advantage of some of the best day hikes around Phoenix and Scottsdale. If you are interested in baseball, the month of March is a particularly good time to visit as the MLB uses many stadiums around the Valley for Spring Training. All in all, besides the summer months, there really isn’t a bad time of year to spend one day in Phoenix. On the morning of your one day in Phoenix, it’s time to take advantage of one the best city day-hikes in the country: Camelback Mountain. Located in between Pheonix and Scottsdale, Camelback Mountain has two quite challenging trails and the summit provides spectacular views of the entire Valley. We recommend getting to the mountain early, as this is one of the most popular day-hikes in all of Phoenix and it gets very busy very fast. Another benefit to getting there early if you’re visiting in the summertime is that you can hike to the summit before the worst of the Arizona heat hits. There are two trails that can take you to the summit of Camelback Mountain: the Cholla trail and Echo Canyon. While both trails are considered to be challenging, the Echo Canyon trail is incredibly strenuous and we wouldn’t recommend hiking it unless you have a high level of fitness and experience. Though it is the most popular trail on Camelback, many inexperienced hikers injure themselves on the trail every year due to underestimating just how difficult Echo Canyon actually is. The Cholla Trail, while certainly steep in parts, is definitely a better option if you want a more enjoyable and less strenuous hike up Camelback. Keep in mind it is still considered a difficult hike, however, it is longer than Echo Canyon and less steep in most parts. No matter which trail you take or what time of year you are going up Camelback, make sure that you bring enough water and stick to the designated trails. Many people injure themselves each year due to falling rocks or heat stroke and this can be easily prevented. If you’re not interested in hiking Camelback, then spend the morning of your one-day Phoenix itinerary learning about the native flora at the award-winning Desert Botanical Gardens in Papago Park. You could easily spend hours in this beautiful park enjoying all of the unique plants that are native to Southern Arizona. If you are visiting Phoenix with kids and think they wouldn’t be interested in either the hike or botanical gardens, the Phoenix Zoo is also located in Papago Park, right next door to the gardens. It is filled with interesting and well-cared-for animals and is the largest independently-owned zoo in the United States. In the afternoon of your one day in Phoenix itinerary, you again are left with a couple of options. After experiencing some of the incredible and unique nature of the Pheonix metro area, it’s time to get a little bit of arts, shopping, and culture in your afternoon. After you hike on Camelback or stroll through the botanical gardens, head to Old Town Scottsdale and experience some of the best shopping and restaurants in the West. Old Town Scottsdale is an eclectic mix of old-timey western town merged with trendy cafes, restaurants, and boutiques. There are a number of shops to browse including typical tourist shops where you can pick up Arizona souvenirs and turquoise jewellery, to western supply store where you can shop for the perfect pair of cowboy boots, to trendy food shops and fashionable boutiques for those with more modern sensibilities. If you’re keen to continue shopping, then head to nearby Scottsdale Fashion Square, a high-end shopping centre that is the largest mall in Arizona and one of the thirty largest malls in the entire country. If you are serious about shopping, then no Phoenix itinerary is complete without a stop here. If browsing shops doesn’t interest you, then spend your afternoon getting a bit cultured at the unique Musical Instrument Museum, or MIM, in North Scottsdale. The only museum of its kind in the entire world, the wonderful spot houses a vast collection of international and hard-to-find instruments and is a great place to learn about musical history. There are instruments from every country in the world in this one small museum and it is very much worth a visit. After being both active and cultured during the day, it is time to let loose in the evening and experience some of the Phoenix’s areas amazing restaurants and nightlife. Start your evening checking out Pheonix’s fantastic restaurant scene. Because it is quite a diverse city, there are numerous cuisines available throughout the Valley and a wealth of restaurant choice. Depending on your mood, you could dine on some of the best Mexican food in the USA at an affordable dive or have a Michelin-star-worthy tasting menu meal created from one of the best chefs in the country. Visitors spending one day in Phoenix are truly spoilt for choice so make sure to do your research and be ready to have at least one or two spectacular meals while travelling to the Arizona capital. After gorging yourself on some seriously good food, it’s time to check out another thing that the Phoenix area is known for: nightlife. The Phoenix metro area has three main nightlife areas and there are a number of places where you can drink and dance into the wee hours of the night. 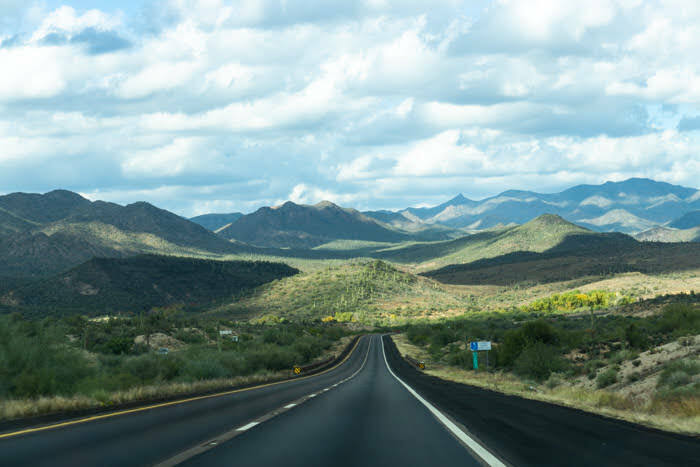 Just keep in mind that Arizona has some of the most strict DUI laws in the country, so always make sure not to get behind the wheel if you’ve been drinking. If you’re keen to go out on the town, Old Town Scottsdale is the most obvious and one of the best choices. There are numerous bars and clubs that you can hop to and from all within easy walking distance. Some of my favourites include Whiskey Row and Citizen Public House. If you want a change of scene or a younger crowd, head to Tempe’s Mill Avenue. Home to Arizona State University, this is a popular area for students to go out and has something going on most nights of the week. If you have two or three days in Phoenix, there are numerous ways you could spend your time. If you don’t want to venture out of the general Phoenix metro area, take some of the alternative suggestions listed above to occupy your time. If you’re interested in hiking, there are myriad Phoenix and Scottsdale day hikes that are suitable for many skill levels. Some of the most popular include Pinnacle Peak or Piestewa Peak. Another great option if you have three days in Phoenix (or even two days in Phoenix) is to go on a day trip. The iconic red rocks of Sedona are only about 2 hours north or you could opt to explore charming Prescott, Payson, or the underrated Tonto Natural Bridge. The options are countless. If you are interested in golf, Phoenix is one of the country’s premier destinations for it, with an incredibly high concentration of courses. It is also cheaper to go if you are visiting in the summer months, however, you may need to head there well before 6 AM to beat the heat! The city of Sedona is a great day trip from Phoenix if you have more time! La Fonda del Sol – This unassuming Mexican restaurant located in a strip mall in Scottsdale is a local favourite. They churn out traditional Sonoran meals at affordable prices and well worth a stop if you want some great Mexican cuisine in a laid-back setting. Arcadia Farms Cafe – This cafe located in Old Town Scottsdale is a perfect place for breakfast or lunch. They serve healthy food sourced from local producers in a lovely garden setting. Their cakes are also delicious. Cafe Monarch – A hip and trendy dining establishment in Old Town Scottsdale, this is definitely more of a “special occasion” place for dinner. Considered to be one of the 100 best restaurants in America, they have a delicious seasonal menu that is always changing. Grassroots Kitchen – A southern-inspired restaurant in Scottsdale, this place has a delicious and diverse menu at mid-range prices. Portion sizes are large and they have a cosy outdoor seating area and an extensive wine and beer list. Postino – A Phoenix favourite, this original version of this restaurant is housed in a former post office in the Arcadia neighbourhood of Phoenix. There are several locations of this restaurant throughout the Valley and they serve delicious bruschetta boards, sandwiches, salads, and soups. They also have an extensive wine list and great happy hour deals. Airbnb – If you’re looking to save some cash during your one day in Phoenix, then Airbnb is a fantastic option for you. There are countless properties available throughout the Valley that will suit any budget or personality. If you are new to Airbnb, you can click here to get up to $40 off your first stay. Not quite what you’re looking for? Click here to browse other hotels in Phoenix! Spending one day in Phoenix is a great way to enjoy this desert metropolis and get a taste of what the Arizona capital has to offer. Are you planning a one-day Phoenix itinerary? Have you been to Phoenix? Let us know in the comments! Thanks for informative sharing. I also have a plan to go there in coming up days to enjoy some time with my family. I hope so that it will be a really great time for us. Glad you found the article helpful and I hope you have a great time in Phoenix!